May 26, 2006, Vancouver, BC -- El Nino Ventures Inc. (TSX.V: ELN; OTCBB: ELNOF; Frankfurt: E7Q) is pleased to announce that it has entered into an Option Agreement with Falconbridge Limited (TSX: FAL.LV and NYSE: FAL) to explore the Bathurst Mining Camp, New Brunswick. The Bathurst Camp is a world class mining district with full mining, milling and smelter infrastructure, containing numerous copper, zinc, lead and silver volcanogenic massive sulphide deposits of different sizes, ranging up to the Brunswick # 12 deposit which contained more than 300 million tonnes of massive sulphide. The Brunswick # 12 zinc, lead, copper, silver mine, owned by Falconbridge, currently operates at approximately 10,000 tonnes per day. El Nino Ventures will initially have the opportunity to earn a 50% interest in a large number of mineral claims and two permitted areas held by Falconbridge occupying approximately 108,800 hectares (approximately 268,736 acres). In order to vest with a 50% interest El Nino is required to spend $5.0 million on exploration by March 31, 2008 with a minimum expenditure of $2.5 million by March 31, 2007. Upon vesting with a 50% interest in the Property El Nino Ventures will have 90 days in which to elect to carve out one or more Project Areas from the existing Property, in each of which El Nino can increase its interest to 65% by spending an additional $2.0 million over three years, and can increase its interest in each Project Area still further to 75%, by spending an additional $3.0 million over another two years. Falconbridge can back-in to increase its position from either a 35% or 25% interest level to 50%, by contributing 2.5 times El Nino's expenditure made to increase its interest above 50%. Falconbridge may increase its interest in one or more Project Area from 50% to 70% at any time by electing to complete a Feasibility Study, or expend an additional $20 million on each Project Area within three years: or five years if underground work is necessary to complete the study. Falconbridge will have the right to process El Nino's share of ore from any future operation. The optioned claims and permits overlie a highly prospective sequence of volcanic and sedimentary rocks which extend for kilometres and have largely only been explored to shallow depths. Falconbridge as Project Operator, will employ leading edge deeply penetrating geophysical techniques, including Titan 24 surveys to define drill targets. These systems enable highly reliable testing to much greater depths than earlier surveys. Approximately 24,000m (over 78,000 feet) of diamond drilling comprising about 34 diamond drill holes, employing three drill rigs, is anticipated to be completed during the first year program. Practically all of the funds contributed by El Nino to the initial program will be devoted to diamond drilling. The program is scheduled to commence immediately. A Management Committee, comprising two representatives each from El Nino Ventures and Falconbridge will make all strategic and planning decisions relating to exploration of the Property. One of El Nino's exploration personnel will work with Falconbridge's Bathurst exploration team during the first two years of the Agreement. Jean Luc Roy, El Nino's President, commented "The Bathurst Option and Joint Venture Agreement will allow El Nino to participate in the exploration of a world class mining camp, using the expertise of the Falconbridge technical team. We look forward to an aggressive and exciting 2006/2007 exploration program as El Nino begins the Bathurst zinc/base metal project, and continues to acquire new projects, in our targeted areas of Canada, Alaska, and Eastern/Central Europe". Normand Dupras, Director of Exploration, Bathurst, for Falconbridge Limited stated "We are very pleased to be commencing this new program with El Nino Ventures. 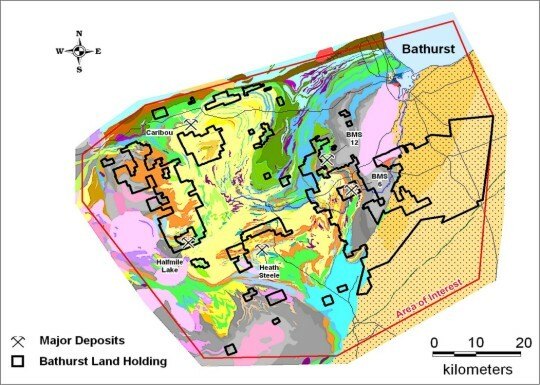 Our focus remains committed to finding a new mineral deposit in the vicinity of the existing Bathurst mine site, utilizing our vast database and advanced technology".